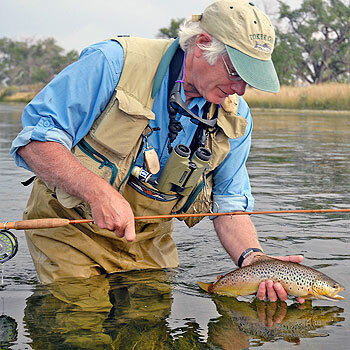 Dave Hughes, is editor of the Flyfishing & Tying Journal and author of more than 20 books about fly fishing for trout. They include the classic Western Hatches (with Rick Hafele), American Fly Tying Manual, Handbook of Hatches, Reading the Water, Tactics for Trout, Strategies for Stillwater, Dry Fly Fishing, Nymph Fishing, Fly Fishing Basics, Wet Flies, the massive Trout Flies, Essential Trout Flies, Taking Trout, Trout From Small Streams, and Western Mayfly Hatches (with Rick Hafele). His latest book is titled Nymphs for Streams and Stillwaters, and will have more than 300 pages of text and 1,000 color photos of naturals, nymphs, tying steps, and the types of water where you'll want to fish them. Dave Hughes guides us through wet flies covering soft-Hackles, flymphs, winged wets and all-fur wet flies. Learn Dave's secrets to tying and fishing these misunderstood gems. Dave was founding president of Oregon Trout in 1983, and was awarded life membership in the Federation of Flyfishers in 1985. He is a life member of the Flyfishers Club of Oregon and his home club, the Rainland Flycasters in Astoria, Oregon. Born on the 4th of July, 1945, Dave worked his way through college at jobs specializing in the 3 Ds-Dirty, Difficult, and Dangerous: mink ranches, tuna canneries, and shrimp boats. He graduated from the University of Oregon in 1967, from Infantry Officer Candidate School in 1968, and served 6 months in Viet Nam as a communications site commander in the Mekong Delta and one year as liason officer to the Commanding General of all communications in the VN theater. Dave is an accomplished amateur aquatic entomologist. His hobbies include collecting, identifying, and photographing aquatic insects that are fed upon by trout, as well as tying and fishing the flies that match those insects. He lives in Portland, Oregon with his wife and daughter.